Northwest Ohio Urgent Care in Maumee, OH Is a Walk-in Pediatric Medical Clinic for Children of All Ages Open 7 Days a Week! Our Doctors Are Ready to Help You and Your Family Feel Better! Finding the appropriate urgent care services for your child when an accident happens isn’t always the easiest endeavor in the Maumee, OH area. Luckily for your family, Northwest Ohio Urgent Care has your child covered! 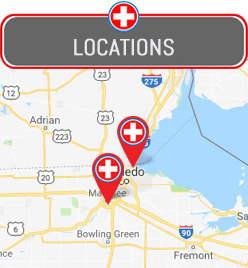 We are an urgent care clinic centrally located in Maumee, OH that offers walk-in pediatric urgent care services every day of the week. From fevers to sprained ankles, our urgent care clinic can help your child with a large variety of ailments. All of our pediatric medical services are on a walk-in basis, there are no appointments ever necessary. Rather than rushing to a hospital for immediate care, Northwest Ohio Urgent provides services with minimal waiting time, saving you and your family time and money. All of our physicians have many years of experience working with children of all ages, and provide compassionate care. We hope that our doctors and medical team at Northwest Ohio Urgent Care can help your child feel healthier and happier soon!